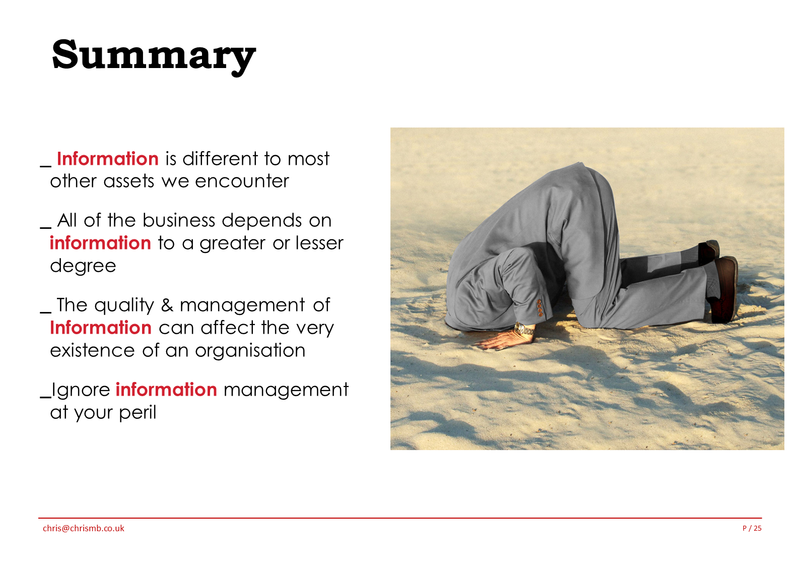 Information Management, Life and Petrol: Is the "Data Asset" really different? During this I raised the question, "is the data asset really that much different form other assets?" 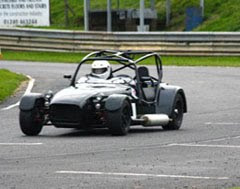 We hear a great deal that Data is an asset, it's got to be managed, few people in the business understands us and so on. 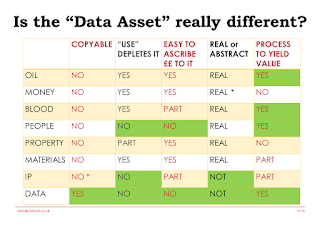 Don't get me wrong, I'm not trying to cast doubt on the importance of data as an asset, but I wanted to raise the level of debate from a subliminal nod to a conscious examination of the characteristics of different "assets" and to compare them with the 'Data asset". 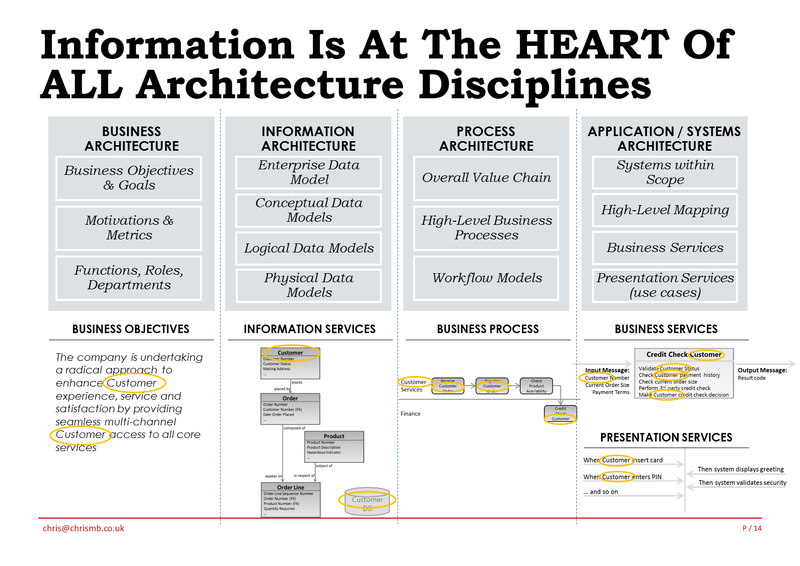 Firstly, let me re-iterate that Information IS absolutely at the heart of the business, my recent white paper talks at some length about this and the diagram here briefly illustrates 4 business architecture disciplines & the vital role of data in each of these. However what I want to raise here is just what are some of the characteristics of core assets in the business, and if as we all say data IS one of those key assets, how, if at all do these characteristics differ in the "Data asset" compared with other common assets that we frequently encounter in our organisations? So first of all lets have a think about some other "assets"? 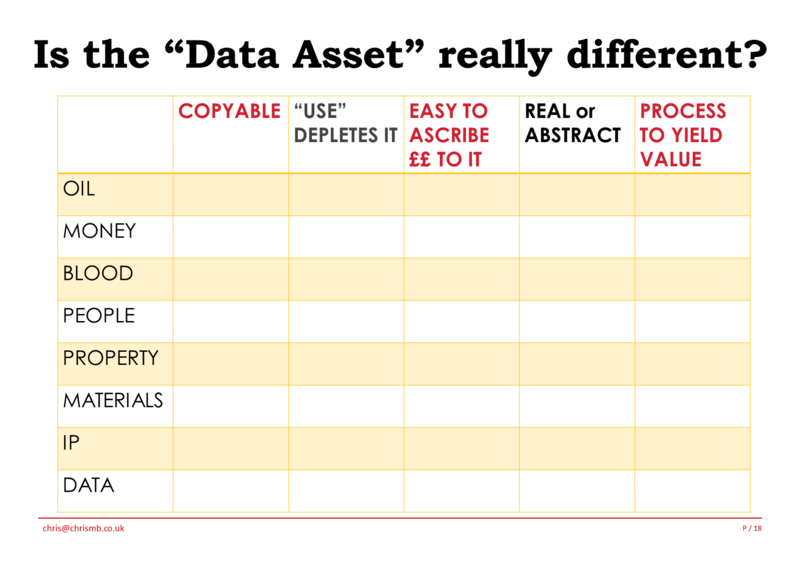 I've picked 7 other assets seen across a variety of businesses and tried to compare them with the "data asset". Now I'm sure that I could have come up with further asset types and asset characteristics, and I may well do so as this analysis develops, but for now these are the ones that I start with. So let's analyse these assets against the characteristics & see what (if any) conclusions we can draw from it? Oil is not copyable, and most definitely using it depletes it. It is definitely usual practice to give a value to oil (the $50 barrel for example) and it is a real concept. Finally it has to be processed to be turned into something useful like petrol, diesel or plastic. So you can't (legitimately) copy money, and as I know all too well with two sons at University, using money depletes it, and naturally you give a value to money. It's mostly a real concept being underpinned by Gold stock, and doesn't have to be "processed' to deliver value. Blood isn't copyable in the mainstream (although as we speak blood substitutes are being trialled), and use of it depletes it (it has to be re-cleaned & oxygenated after use). It's not too difficult to ascribe a value to it, and it is a real concept. Finally it has to be processed by our organs to yield value. People as we know them are not copyable (although biological cloning is possible). I've said that use of people does not deplete the resource as we can apply our skills & intellect many many times. However, people do age and limbs and minds fade so perhaps this should be answered as "partly true". It's not widespread practice to ascribe a monetary value to a person except in a few cases (e.g. professional sportsmen). People are real and without trying to get too philosophical, they have to do something to yield a value. Property such as buildings are not copyable. Sure you can have a plan for a building & use that several times, but its using different bricks, is on a different site and so on. The Eiffel Tower in China is a fake! Using a property does slowly erode it, things wear out and need to be maintained. Property does have value & it's usual practice to give it such. Property is a real concept, but doesn't have to be processed to generate value. So here I'm talking about raw materials. Again, without a sci-fi replicator they are not copyable, and just like a match the act of using them depletes them. Most materials have a monetary value easily ascribed to them, for several that's the basis of the commodities market. They are real not abstract things and pretty much for the most part have to be processed to yield a value. IP is not legally copyable. IP thrives on being reused so is not depleted by use. There is frequently a monetary value allocated to IP and much like a thought or an idea it's mostly an abstract concept. Finally, IP must be used (processed) to gain real value from it. So what about data; how does this stack up against the asset characteristics? Data is copyable; with digital media any number of copies can be taken without the data being degraded. Using data does not erode it or make it wear out. Sure the relevance of the data may decrease over time but it does not wear out. Whilst there is much talk about "monetizing" data, this is still not a widespread practice but will no doubt become some in the future. Data is an abstract concept since its representing something else. Data needs to be utilised by processes to have value (and conversely processes must have data to operate upon). Having looked at these 8 different assets, and the 5 characteristics is there anything that jumps out at us? If we look for assets which have the same values of characteristics as observed in "data" then we're going to be disappointed. Of the 5 characteristics, 3 of the assets (Money, Property and Materials) have zero common values of characteristics. 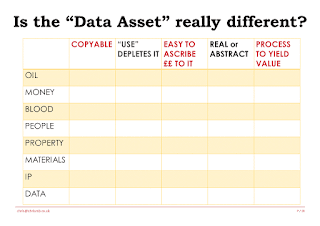 2 of assets (Oil and Blood)have one common characteristic value shared with "Data". Intellectual Property (IP) has two common characteristics, and heading the pack with three common characteristics is People. It's interesting to note though, that there aren't any of the assets that share 4 let alone 5 of the characteristics as we see in Data. 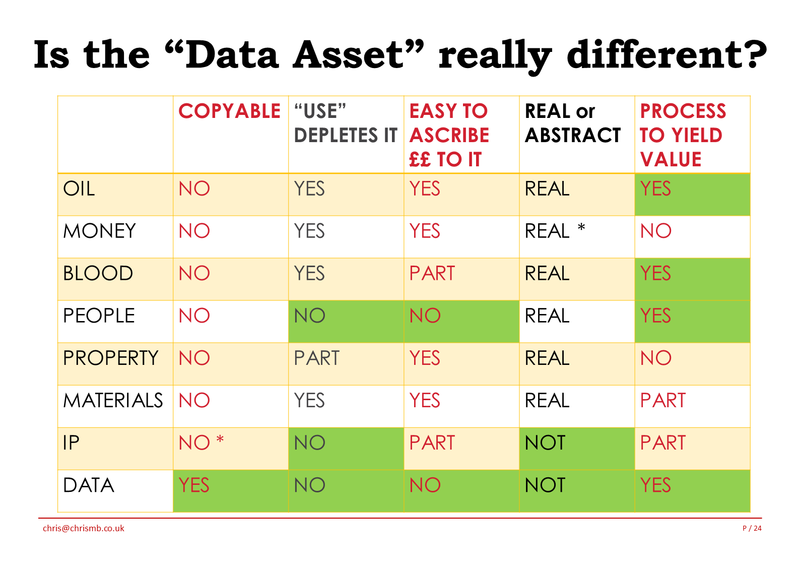 Thus it's probably reasonable to conclude that: the Data Asset IS different to other business assets that we encounter. 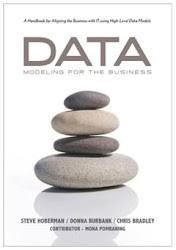 Furthermore, as described in my white paper all of the business depends upon data for its wellbeing. 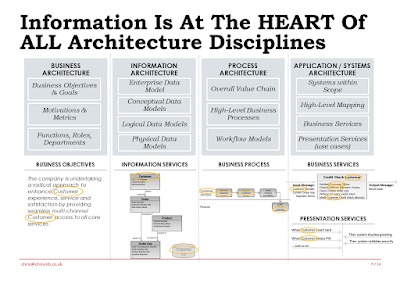 Unfortunately, we still encounter organisations where the various disciplines of Information Management are not understood (or more frighteningly are knowingly not addressed). Indeed, Professor Joe Peppard wrote "The very existence of an organisation can be threatened by poor data quality.” So yes if as we suggest here that it is different, then the management of the data asset requires specific skills and capabilities, the Information professional. 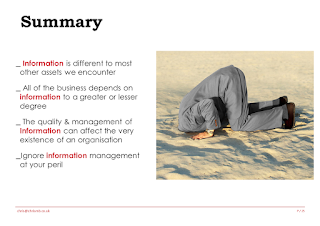 Wise organisations are realising that Information IS a vital asset, it IS worthy of being managed professionally, and yes it IS different. Share some more information about content management,. I have been searching for details about this topic for ages and yours is the best I’ve discovered so far. See http://en.wikipedia.org/wiki/Infonomics for a list of many articles on information value and information asset recognition. It's a very interesting blog. If we look back through the ages, I-M (information management Australia) is linked to human existence and being on this earth starting from the stone age to the current age of micro-computers and spaceships. In one way or other man has been constantly facing challenges in storing, processing and analyzing data into useful information. I have found that the best way to get started in the oil and gas industry is to begin by having a look at an oil & gas specific job board and seeing which roles are available. In my opinion, it's important to use a job board as you maximize the number of jobs in one place, and avoid missing any great opportunities...saves you time endlessly scanning the internet for the best jobs! The oil & gas job board at the moment with the most jobs listed is Oil and Gas Jobs so it may be worth giving that a try as a starting point. Once you have a good idea of the type of jobs which are available for your skills, tailor your resume to emphasize the points which would be relevant. Then simply start sending your resume off for the jobs you like the look of (you just need to register/upload your CV once and you can apply for as many jobs as you like). These simple tips are really simple. I have used all these tips and I am surprised that these all works fine. You are a great advisor. Thanks for sharing. It's a great article. The Information Management system is very key for the data solutions of small, medium or large businesses. Online Attendance SystemCheck out sharadtechnologies and know about Online Attendance System, Online School Management System and school mobile app. Thanks for sharing information with us, Keep on sharing the blog like this. We send equivalent amount of your top up phone with bitcoin to your mobile phones as a recharge. That’s really not an unfair policy. So do not let your online mobile recharge wait for you. Let us serve you.